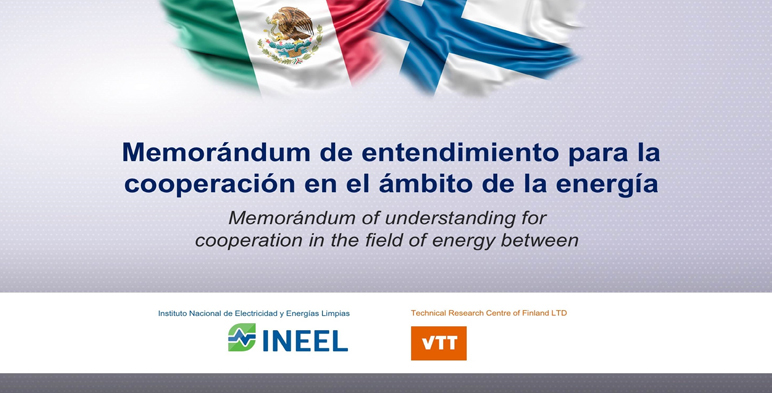 Mexico´s National Institute for Electricity and Clean Energy (INEEL) and TECHNICAL RESEARCH CENTER OF FINLAND LTD (VTT) promote technical cooperation within the energy sector. Within the framework of the inauguration of the "Workshop on National Priorities in Electric Networks and Micro Networks", organized by INEEL with the support of the SENER-CONACYT Energy Sustainability Fund, held in Cuernavaca, Morelos, on September 18, the INEEL and VTT signed a Memorandum of Understanding. During the ceremony the Undersecretary of Planning and Energy Transition of the Ministry of Energy (SENER), Leonardo Beltrán Rodríguez, served as an Honorary Witness during the signing of the instrument. The Undersecretary pointed out that with the agreement the INEEL and VTT seek to develop joint projects in which each of the institutes will contribute their capacity with specialized personnel in the field of research and development in the energy sector, and will subsequently sign specific agreements on the subject of clean energies of mutual interest. The cooperation between INEEL and VTT, under the Memorandum, will generate synergies by sharing knowledge in areas of mutual interest and reciprocal benefit with the aim of activating and taking advantage of experiences in research, technological development and specialized technical support within the national and international energy sector. That will allow to realize high impact projects with innovative solutions focused on topics such as bioenergy, biofuels, energy waste, use of renewable energy sources, smart grids, virtual reality, turbomachinery, control, electronics and communications, and business development sets; among others. The Memorandum of Understanding was signed by Jussi Manninen, Executive Vice President of VTT and Diego Arjona Argüelles, General Director of INEEL. Undersecretary Leonardo Beltrán Rodríguez of SENER was acting as a honour witness for the signing ceremony.